The E+Ready ER310 Emergency Crank Weather Alert Radio from Midland is a valuable tool for emergency situations. It not only keeps you informed during severe weather or civil emergencies, but it can alert search and rescue teams to your whereabouts as well. It can be powered via a solar panel, a hand crank, or its rechargeable Li-ion battery, ensuring long-lasting functionality. 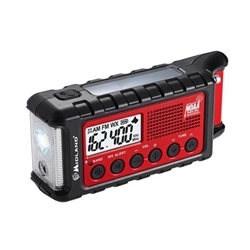 As a back-up power option, the ER310 can run on six AA batteries. The radio can tune in AM and FM frequencies, as well as NOAA weather channels. There are seven preset weather channels with a frequency band between 162.400 and 162.550 MHz. A built-in flashlight with a Cree LED provides 130 lumens of light. It has low, high, and strobe modes, as well as an SOS beacon, which transmits SOS in Morse code for emergency assistance. An ultrasonic dog whistle can help alert canine search-and-rescue teams to your position.